Last week, I was contacted by the Kyle Tomson, president of the Mobile Education Store (MES), with an offer of promotional app codes to some of his company’s apps. I know many SLPs that like the MES apps and they get great reviews; however, I cannot use the apps as I no longer work in the traditional therapy setting and my students have much different language needs. So, instead, Kyle gave me three promotional codes for giveaways; one each for Rainbow Sentences, Preposition Builder, and the new TenseBuilder. If you would like a chance to win one of these apps, comment about a Mobile Education Store app that you use or that you want on my Facebook page or on this post. The winners will be chosen randomly and announced on Monday, September 24th after 6:00 P.M. These are only three of several Mobile Education Store apps for iPad and iPhone and there are more in the works. To find out about about new MES products and other promotions, sign up for the MES newsletter. Free materials are always a good thing - thank you MES! 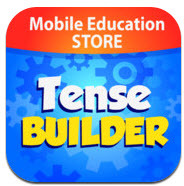 I would love Tense Builder for my students. I love using Preposition Builder with my bilingual students. My Spanish speaking students often confuse English prepositions and this app is just perfect for them. I love MES apps. I have been using Conversation Builder in individual and small group therapy in my school, as well as in several social skills groups. My students love it and it really helps them to think more clearly about how to engage in appropriate interactions with other children. My ASD and non-ASD students all enjoy Question Builder and Story Builder as well. 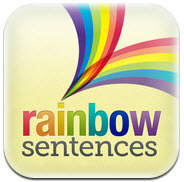 I would love to win Rainbow Sentences to help further supplement my therapy. All three of this apps are on my wish list but they are a little expensive; especially when converting currency. I am giving a talk next month to teachers and therapists on using apps in therapy and I would LOVE to include either rainbow sentences or tense builder in my talk. Please can I get one! I would love to have TenseBuilder. I am doing an Apps in Therapy presentation to a neighboring school distict in two weeks and would love to show TenseBuilder among the apps in the lineup. If I were chosen for one of the other two I know exactly the therapists I would gift them to. I use Rainbow Sentences, Language Builder, and Preposition Builder the most with the population I work with. They are great tools. Thank you for offering these!! I love using Rainbow Sentences and Language Builder. I would really like to try out the Tense Builder as well! Thanks for the opportunity! I would love and use any of these apps, but the Rainbow sentences looks very cool!! Thanks so much for handing these out!! I would love to have Tense Builder! All of Kyle's apps are terrific! I have rainbow sentences and love it. I would love the opportunity to win tense builder. Thank you. I have seen all these apps and they are great. I would love the preposition app because I have a lot of students that are working on that goal. It would be a great app for my students. 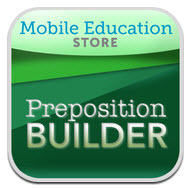 I would love to try the preposition builder app! Thanks for the give away! !